LOL, amazing BIll O'Reilly tactics. I wonder if I'm chatting with Eliza. I'll only reply to your second paragraph, cause the rest is clearly gibberish. Stochastic gradient descent randomly selects a subset of the training set to optimize over. It tunes out the parameters of the network in a way to make the error over this set go down. It does NOT guarantee that the true error, over the whole set, will go down. And we're not even talking about generalization, which is the real difficulty with neural networks. Now that I know that you're trolling, I'm out of this stupid debate. I don't know how many agents compete in the league. But let's assume it's about a thousand. Only a few dozen agents by the end of it. Did they say 16 TPU's per agent specifically? 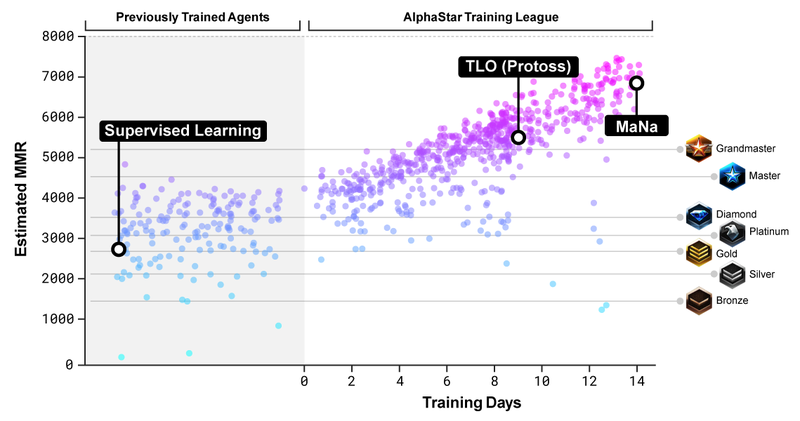 In order to train AlphaStar, we built a highly scalable distributed training setup using [Google's v3 TPUs](https://cloud.google.com/tpu/) that supports a population of agents learning from many thousands of parallel instances of StarCraft II. The AlphaStar league was run for 14 days, using 16 TPUs for each agent. The final AlphaStar agent consists of the most effective mixture of strategies that have been discovered, and runs on a single desktop GPU. so yeah 16 TPUs per agent. Yup, and "many thousands". But I'm not sure you can use commercial computing prices. I don't know if there's any way of taking only cost price, which is essentially manufacturing and electricity (and the former is almost certainly negligible in comparison to the latter). Many thousands of parallel instances of SC2, not many thousands of agents. This became such a toxic thread, and I'll applaud @Waxangel for setting the tone/leading by example in his triggered response. This micro thing got me into reading of SC2 API docs to understand how AlphaStar talks to SC2. As others already pointed out, the SC2 API is unfair by design since it allows to directly perform actions over units, rather than moving a some kind of mouse pointer and performing mouse clicks (or keyboard presses, whatever). This approach to interfacing a game is not questionable, considering a fact that all previous bots failed to win a human even with that extremely unfair API. Why to make anything human-alike, if bots can't win with unlimited control features? However, what gets me angry is how all those "bot vs human" matches are presented. Am I exaggerating, or developers of AlphaStar try to claim that their bot is "as human-alike as possible"? (1) Is it kind of PR, right? I didn't dive into details of what the "Rendered" is, but I assume it is as close to the human<->sc2 interface as possible. I also assume that the AlphaStar uses "Feature Layer" or "Raw" instead. Is there any article describing what API is used by the bot and a some kind of proof that pick is fair enough (i.e. human-alike)? (2) So far I can't find any. So, if the answer to (1) is "yes" (meaning that developers DID claim their bot "as human as possible") and the answer to (2) is "no" (meaning there are no any proof that their claim is true) then developers trying to cheat a community. I'm not against bots who cheating in a game. I'm against developers who are cheating the SC community (which is mostly consist of people who are not professionals in the programming field) and not saying about overpowered interface that their cheating bot has. Does anyone know if they plan to alter the parameters and redo the tests so the AI can focus more on the strategy rather than the micro aspect of the game? I mean there was obviously a lot of decision making and early game choices involved by the AI, but I feel we could make the test even more interesting by tweaking a few things. For example involving camera movement more and removing it's ability to see the whole map and react to everything instantly. Because spotting something on the minimap and having to change your camera to that spot to react while executing something on the other side of the map, and keeping up your macro is not simply a mechanical, but a strategic decision that players due to APM limitations, so I think it will be really interesting to challenge the AI more and see how it will utilize it's APM under different rules. Camera movement and positions is also part of proper macro and it eats up a chunk of the players APM, so by focusing more on the macro could lead to neglected micro and vice versa. Not only that, but human APM by itself is heavily inflated. If we look at the conscious actions a human can make in a single second, there's really not that many non-spam actions we can physically make. While an AI that can see the whole map and has control over everything with 250 precise APM is above anything a human will ever be capable of. And I know this isn't about humans, it's about the advancement of the AI, but I believe that limiting it's ability to win due to inhuman mechanics will lead it to figuring out other build orders and strategies to win earlier or later in the game, and it will be a vastly more interesting experiment. So far this is very impressive though and I hope they have more in store for us! The reason why it won was because it was more precise,not better at anything else though. Precision is what made it win every match it played. It was definitely worse at decision making. It did have crazy micro skills though. I have no confidence that they will put any effort into doing this though. In chess they just had a match vs Stockfish under their own conditions and disappeared claiming Alpha is by far the strongest chess entity. There are concerns that it was just a publicity stunt because Stockfish appeared to be making weaker moves than it normally would. Here they will probably pull similar crap by beating the human pros with inhuman mechanical efficiency like it did in the Mana match and portraying it like its so great. Hopefully I'm wrong. They should have Alpha compete in TCEC once in chess and in SC2 give it legitimate human mechanics in SC2 instead of pretending that a human can use their APM so efficiently like Alpha does. They don't even appear to be acknowledging that it's way too efficient mechanically in SC2 right now. It seems they're parading it as on an equal playing field compared to a human to the audience who doesn't know any better. He talks about AlphaStar from 32.50. Most of it's familiar if you watched the exhibition matches, but there's an interesting bit at 39.24 where he talks about how they added intrinsic motivations to get build diversity (and you can see the rise of the stalker anyway).